A blog dedicated to excellence in piano teaching. I was a shy, introverted kid. I wasn’t exactly “actress material”. However, I did want to be part of this play. I auditioned, and somehow won the part of Felicity’s best friend. My mother sewed me a Colonial era gown, complete with gathered sleeves and a white bonnet. I practiced and memorized my lines. I attended rehearsals, and helped paint the sets. I didn’t speak loudly enough onstage for my lines to be easily heard easily from the audience’s perspective. The play director asked me to speak out more. My mother coached me at home, letting me know I still wasn’t speaking loud enough. When I tried, I could deliver a louder rendition upon being asked. But the next time I read a line, I reverted to my normal volume. It’s here! I’ve been hinting about this on instagram all week. I’m so excited to today share with you a project I’ve been working for the past few months. Inspired by a project I saw at my town’s local university campus, I decided to create something similar for my piano students. I call it the “Notes To Self” wall art. The quotes and sayings were chosen with positivity and encouragement in mind. They’re fun to admire, and it’s fun to pick out one to take with you. My students are enjoying this! 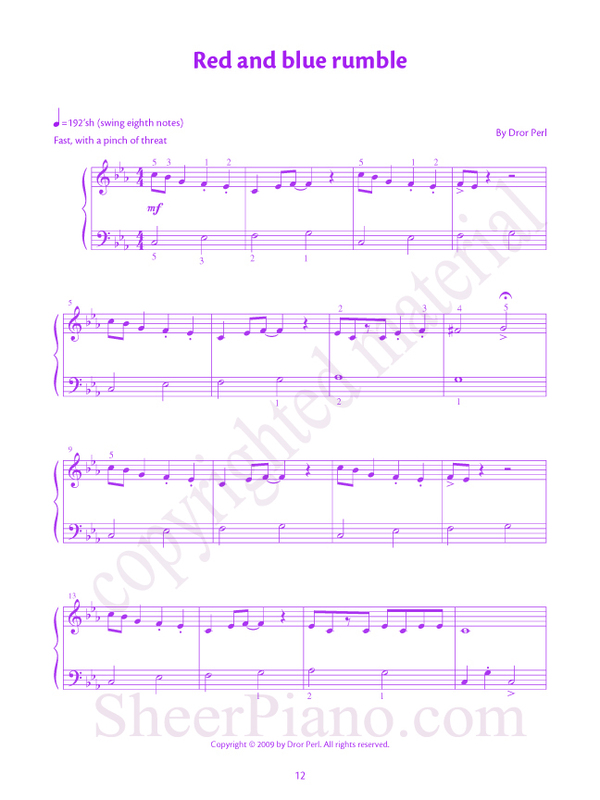 Piano teacher Patti Bennett from Georgia came up with an awesome way to use the music keys printable I created back in 2013 (see this post). She kindly agreed to let me post her photos and details about her incentive idea today! Patti has her students participate in Piano Guild Auditions in May, so she always has a big scale push beginning in January. This year, she was inspired to use the keys printable to create an entire incentive program to get her students enthused about learning their scales, cadences and arpeggios following the Guild requirements. Patti started by preparing packets of the keys for each student, cutting them out and placing them in Ziploc snack bags with their names. There are five little bins for the major keys: one for one octave (white paper), one for two octave (beige paper), one for three octave (blue), one for four octave (red). She also printed out sets for the minor keys. She also created her own additional key cards for 10 hours of practice and for 5 pieces memorized. As students master their scales and more by memory, they go to the bins, grab out their packet, locate the key and put it on their key ring on this bulletin board. Patti says that the parents have been coming over as well, excited to watch this part. Patti says that everyone is all smiles and eager to work on scales, as opposed to saying “do I have to work on scales”, or “I forgot to practice my scales” (sure you did) or whatever other excuse. What a great way to inspire everyone to work hard on those scales and more! ;) Great job and thanks for sharing, Patti! I saw this wonderful idea in one of the wonderful facebook groups for piano teachers (this one). I am not sure who to credit with the original idea — I suppose it has been done many times by teachers in the past. The idea is that when a student learns a Christmas piece, they get to add a paper strip to the chain. I just started the chain this week with my students. I love how this is a collaborative (instead of competitive) project that allows the entire studio to participate. Our chain already reaches across the entryway of my studio! It will be fun to see how long the chain gets by the time Christmas is over! Our last Forum Q&A topic was about keeping teenager students engaged in their piano study! Check out all the great responses to this topic by clicking here. Two years ago, I published a blog post with a few pictures of items in my prize box at that time. (Read the full details about my current incentive program here.) It’s about time I took another peek in my box to see what is in there now! I’ll try to take some photos soon — in the meantime, please take a moment to share about your students’ favorite prize items in the comment section below! Update: Here are some photos of the items currently in my piano prize box! Our last Q&A Forum topic was about organization. I loved reading your ideas — thank you all for your responses! How do you keep teenagers engaged? As we know, sometimes they are taking lessons only because their parents want them to. Or, sometimes they are over-scheduled. Please take a moment to share your thoughts in the comments below — we would love to hear your ideas! Watch your student (and his/her parent) swell with pride at that last one. Saying that line sure beats a conversation that sounds like you are trying to justify or talk the parent into switching from 30- to 45-minute lessons. It’s all in how you present it. Learning scales or bumping up the tempo might at first seem like a chore, but presenting the next new challenge as an acknowledgement of their accomplishments and hard work can help motivate students for the next thing. They’ve worked their way to this point, after all, and they should be proud of it! I’ve always wanted to hear Dr. Faber speak since I am a huge fan of the Faber Piano Adventures method, and I’ve heard such good things about their sessions. At the NCKP, I had the privilege of attending their publisher showcase and this session on student-centered teaching, which provided a lot of insight into the Fabers’ research on human learning and their teaching philosophy in general. It was fascinating! Student Centered Teaching: The Process, by Randall Faber. F @ 11:15am. Dr. Faber began by talking about the teacher perspective. He shared a wonderful photo of a child sitting on the piano bench, eager and excited to learn, looking up into the camera (or into the teacher’s eyes). The next photo was of a stern looking teacher, looking over his reading glasses from his chair alongside the piano. Everybody laughed when they saw this photo! This is the student perspective! Andrea & Trevor Dow from yesterday’s interview have kindly agreed to sponsor a giveaway of Episode 1 of The Adventures of Fearless Fortissimo! This pdf is a $19.95 value and contains Early Elementary, Elementary, and Intermediate Level versions of the pieces, accompanied by a three page comic. Once you’ve purchased the pdf, you are free to print off as many copies as needed for use with your students! Read more about The Adventures of Fearless Fortissimo piano music for boys by clicking here. To enter to win, leave a comment on this post! Ask Andrea & Trevor a question you still have after reading yesterday’s interview. Tell us about how you would use The Adventures of Fearless Fortissimo in your studio! 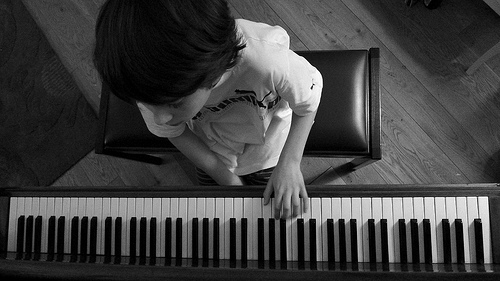 Or, share any tips you have about keeping boy students motivated in their piano studies. You may earn one additional entry in the giveaway by sharing the link to this giveaway on your blog or on your facebook page. Be sure to leave an additional comment on this post to let me know you’ve done this, so that you get your extra entry. The winner will be chosen via random number generator. Enter before Thursday, May 19, 2011 @ midnight for your chance to win! What are some of your goals in taking piano lessons? I want to be able to play hymns and hymn arrangements for church services. I want to be able to play from chord charts to play with my church’s worship band. I like to play by ear but but I want to learn how to read music too. I just want to get better at piano just because I enjoy playing for my own enjoyment. I read something this week that mentioned in passing the benefit of engaging the emotions for learning. This idea really stuck with me, and I haven’t stopped thinking about it since. It makes perfect sense, but I just never thought about it much before. I think this idea is worth some consideration. Neurologically, humans learn best when their emotions are engaged. Various research has been done that suggests the benefit of learning when the emotions are engaged (see “For Further Reading” below). An effective speaker will appeal to the listeners’ emotions in order to affect and influence them to agree with the points made, support the viewpoint, and maybe even motivate them to do something about it. Similarly, an effective teacher will connect with the students’ emotions to make the student interested in the topic and motivated to learn. When the emotions are engaged, the learning moment becomes both meaningful and memorable. 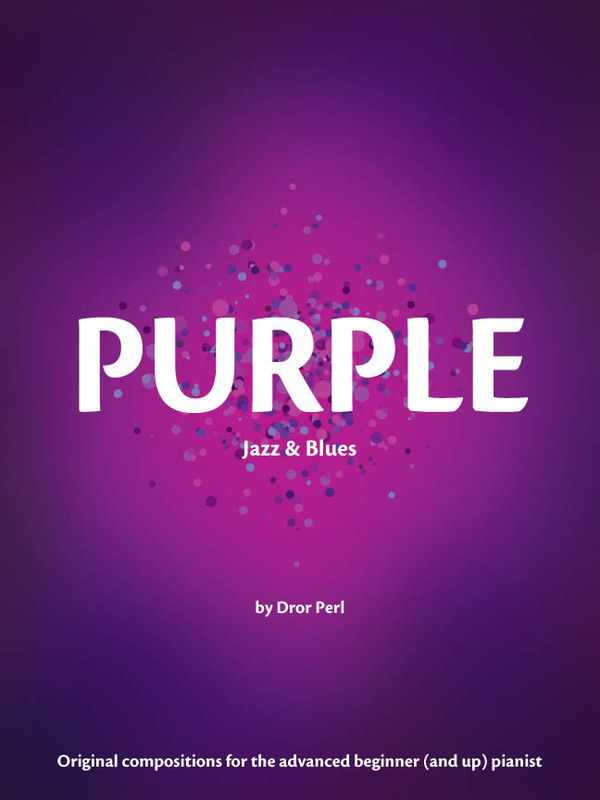 A few weeks ago, I received a friendly email from composer Dror Perl asking if I’d be willing to write a review of his music books. I, of course, said yes, and so Dror sent me complimentary copies of the Red and Purple books. Here is my full review of his wonderful books! Sign up to get blog updates delivered to your email inbox. Choose frequency...Send me each new blog post!Send me a digest at the end of the week! Color In My Piano is proud to be ad-free! Please consider donating to support the blog or surprise me with something from my Amazon wishlist. Thank you!